US gold futures settled up 0.3 per cent at $1,318.50. The greenback held firm versus a basket of other currencies, on track for its best week in six months. rose on Friday as a gloomy global economic outlook dented risk appetite, but a firm dollar stemmed bullion's advance and kept the metal on track for its first weekly decline in three. Spot gold was up 0.3 per cent at $1,313.95 per ounce at 1:54 pm EST (1854 GMT), having recovered from an over one-week low of $1,302.11 touched on Thursday. 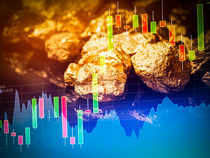 "With equities a little lower here, we're getting some flight to safety in gold," said Bob Haberkorn, senior market strategist at RJO Futures. "The fact that the US economy is not seeing weak data like the euro zone is supportive of the dollar. If the dollar was a little weaker today, gold would probably be up $7 or $8, instead of $3." Stocks fell worldwide for a third straight day on worries about a global slowdown and the lack of any sign of a resolution to a US-China trade row. US President Donald Trump said on Thursday he did not plan to meet with Chinese President Xi Jinping before a March 1 deadline set by the world's two largest economies for a deal. However, while bullion has risen about 13 per cent from 1-1/2-year lows touched in August, mostly because of volatile stock markets and a dovish US Federal Reserve, a strong dollar has driven gold down about 0.3 per cent so far this week. Playing on investors' minds, the European Commission cut its forecasts for euro zone economic growth, while in Washington a logjam continued over plans for a border wall with Mexico. However, holdings in the world's largest gold-backed exchange-traded fund, the SPDR Gold Trust, have fallen more than 1 per cent for the week. "We see no reason for the outflows in view of the falling stock markets and declining bond yields .... we believe gold should be in good demand as an attractive alternative investment and a safe haven, partly because there are after all numerous political risks," Commerzbank said in a note. Meanwhile, palladium rose 0.8 per cent to $1,396 an ounce. Spot silver gained 0.5 per cent to $15.79, while platinum was up 0.1 per cent at $796.50.